A “dragon” will now greet National City boaters as they visit the boat launch ramp and neighboring marina. 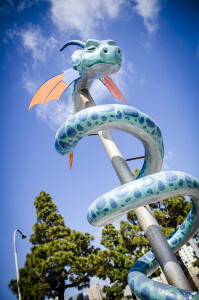 The Port of San Diego’s latest public art installation is “Sea Dragon,” which is located at the National City Aquatic Center. “Sea Dragon is located in between Pier 32 Marina and the public boat launch ramp at Pepper Park. It was created by artist Deana Meando for the port in 2006 and later purchased for its Tidelands Collection. The public artwork stands 17 feet tall and is part of the port district’s outdoor collection of more than 70 items.